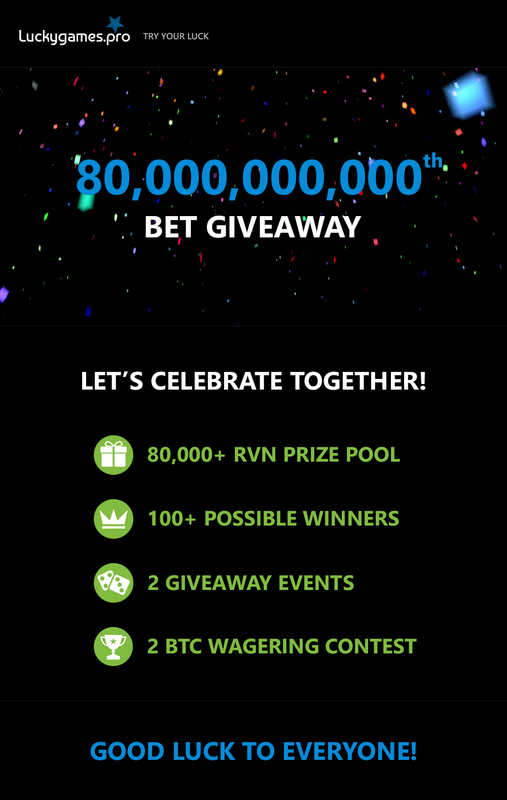 We are glad to announce our next BIG Giveaway to the upcoming 80,000,000,000th bet with 80,000+ RVN prize pool. You need to hit the bet ids listed on Luckygames forum. Each winner takes 800 RVN and 8 Days LEGEND (Total 100 Winners). 80,000,000,000th bet. Each winner takes 800 RVN and 8 DAYS LEGEND. Post your prediction number in the comments on the Luckygames forum giveaway thread. Wagering Contest with 2 BTC Prize Pool will be held on the next day since we hit the 80th billion bet at 00:00 UTC (server time). Follow the Contests page!